a Raised scar come in two varieties, Keloids and Hypertrophic scars. We treat raised scars with injection of substances into the scar itself. Lasers can also be used, but the injectables cost less and work as well as laser therapy. We use Triamcinolone or 5-Fluorouracil as injectables.Triamcinolone is a type of cortisone. 5-Fluorouracil is an antimetabolite originally used to treat cancer. Both options work well for treating raised scars, but Triamcinolone causes more medium to long-term localised side effects. Triamcinolone can result in hypopigmentation (whitening of the skin) or the formation tiny blood vessels (telangiectasia) in 20% of patients and skin thinning (atrophy) in 10% of patients. None of the above problems occurs with 5-Fluorouracil, although the injection itself is more uncomfortable and can cause a burning sensation for 30 minutes to a few hours. Most patients tolerate the injection easily. If required, we apply a numbing gel to the scar for an hour before the injection. 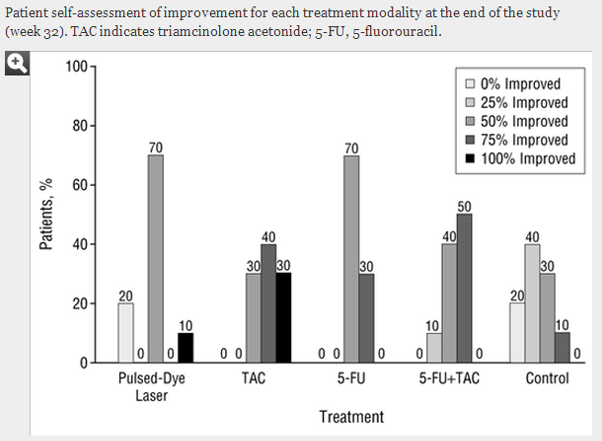 Triamcinolone is safe to use for bigger raised scars and 5-Fluorouracil once the scar becomes flatter. We do the injections every 1-4 weeks and space the injections 1cm apart along the scar. The more frequent the injections the faster the response. We use either a very thin needle or a Dermojet for the injections. A Dermojet is an air pressurised device that can deliver the Triamcinolone or 5-Fluorouracil into the scar in a much quicker and less uncomfortable way. We use the Dermojet for bigger scars and once the scar become small and flatter we tend to switch to the standard injection technique. Be ready for at least five to ten sessions, depending on the number and size of the scars. I have had surgery for keloids and the results are so bad . i now have a very big hard ugly scar. i used kelocote gel and cica care silicone gel after the operation. it didnt help at all, i am worse off than i was. What do you recommend i do, where do i go from here. Please refer to the information provided on the website regarding treatment of Keloid scarring. You should schedule an appointment with the Dermatologist for the appropriate treatment. Hi I am a black African I have a 7cm hypertrophic scar on my face , it’s taken away my confidence over the last 7 months and I would like to consider treatment, is this steroid safe for black skin? I really want to reduce the raised area more than anything, the colour doesn’t bother me as much when I have makeup on . Treatment options for Hypertrophic scarring (Keloids) are safe on all skin types. I have hypertrophic scaring on my chest. It’s mainly the redness that bothers me not the raised scar. Do the injections deal with the redness too? or would you recommend laser treatment to deal with the redness? What are the cost for injections? I have about 5 small hypertrophic scars, can you give me a rough idea of cost. Dear K. If the scar is raised the treatment will start with the injections that can help for the redness as well. When it becomes a bit flatter, laser is an option too. Cost ballpark R800 per session. Sessions area repeated every 4-8 weeks until the scar flattens.